We get underway with the mystical ‘No Grudge’, a collaboration made with passion from Dutchman Pulsate and his Flemish neighbour Nexus & Tight. This is a song for those long journeys. 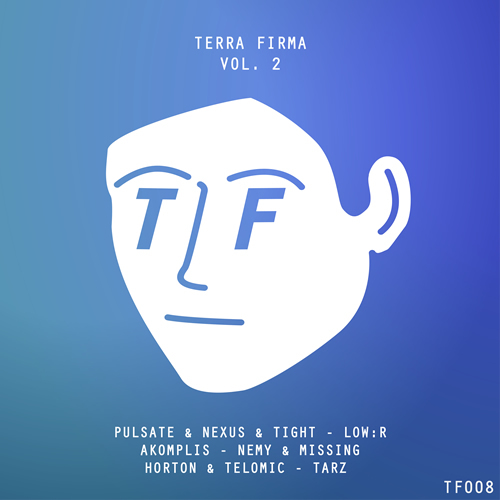 Terra Firma welcomes another new duo to the label in Nemy & Missing. Their deep, soulful and innovative approach to Drum & Bass is reminiscent of heavyweights Alix Perez and Spectrasoul, and track ‘Did to Me’ ticks all the boxes for a perfect techy roller. Having released on Vol. 1, Ben Downton, aka Low:r, is at it again with another major-key groove-busting anthem. Featuring Carl Petros on vocals, ‘Pushing Back the Tide’ is instantly uplifting with its warm piano chords. Next up, Terra Firma’s very own Matt Horton debuts on the label he set up with Warren Rousseau in 2017. Along with Telomic, the tune entitled ‘Ingrained’ features a soft bed of engrossing melodic textures with crisp drums and a dynamic bassline on top. East-Midlands bass-heads Steven Mitchell & Joshua Gerry debut on the label with what can only be described as a shoe-thrower! The aggressive bassline and super-punchy drums in ‘Volvere’ utilise space incredibly well and satisfy our Jump-Up cravings. Finally, we have ‘Soul Switch’, a moody little liquid gem from up-comer Tarz. Here we have a bit of everything, from an oscillating deep bassline, to bouncy drums, and synth stabs in the higher-register. Sophisticated. This release is due out in all major digital stores from 16/01/18 and you can find the links below to pre-order / buy your copy!